Protect yourself from harm and increase positive energy in your life with the Bagua Coin Charm on Red Cord necklace. 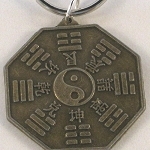 The Bagua Coin Charm includes the Tai Chi symbol (Yin and Yang) to balance your energy. It also includes protective Trigrams and Chinese protection symbols on the back. 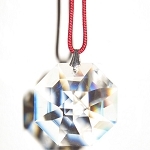 The 30 mm Bagua Coin Charm hangs from a red cord (for complete protection and good luck,) knotted in back. Exclusive to Zen Appeal!